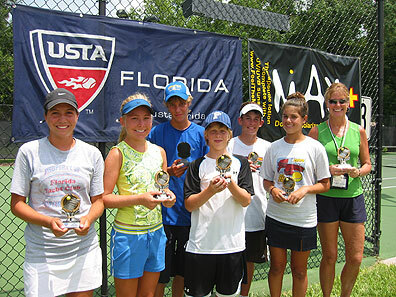 More than 700 young tennis players traveled to Lakeland July 28-30 to participate in the 25th annual USTA Florida’s Summer Section Tournament hosted by the Polk County Tennis Association. 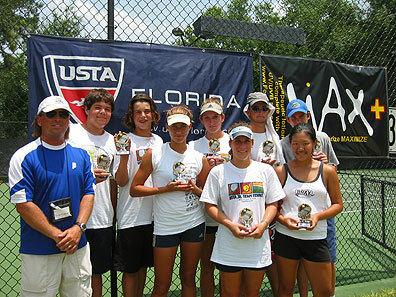 Eighty five teams from across the state battled each other for section champion bragging rights for the USTA Jr. Team Tennis Summer season. Kids competed in divisions ranging from 10's to 18's and in three different skill levels: beginner, intermediate and advanced. 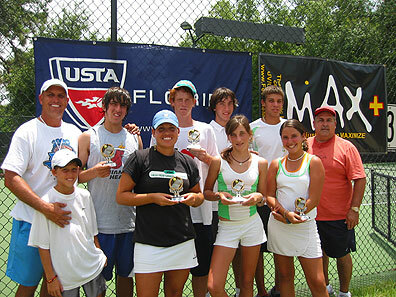 Trophies were awarded to the champions and finalist in each age/skill level except beginner, where all players are winners and each received a participation trophy. Three teams qualified to advance to national competition! 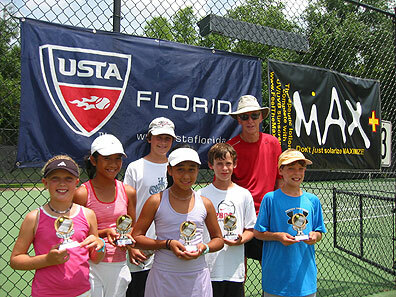 14 & 18 Intermediate champions will compete in Tucson, AZ and the 18 Advanced champions will compete in San Diego, CA. Jacksonville will host the Georgia/Florida challenge for which another 20 teams qualified. 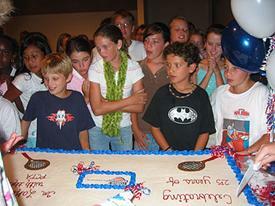 A "birthday" celebration took place Friday evening at the player's pizza party. Cake and balloons were added to the festivities to celebrate 25 years of Jr. 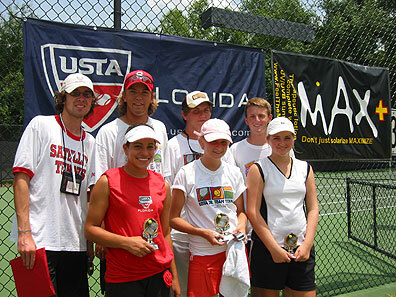 Team Tennis in Lakeland. In addition, players danced and played games which were led by DJ Craig. Door prizes and game give-aways were abundant thanks to Wilson Sporting Goods who donated many of the items. 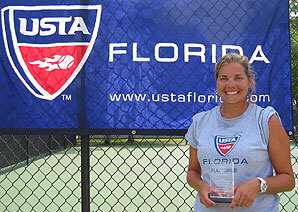 "It's great watching the coaches and kids interacting in such a fun way," said Coordinator of USTA Jr. 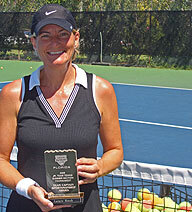 Team Tennis and Tournament Director Jodi Manning. "The kids love having their coaches join them on the dance floor!" 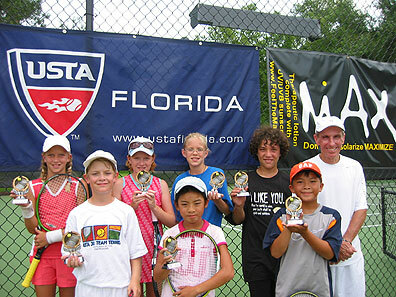 An important philosophy of USTA Jr. 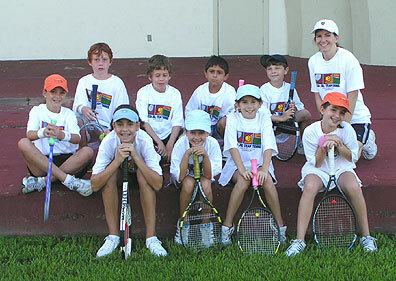 Team Tennis is sportsmanship and teamwork. 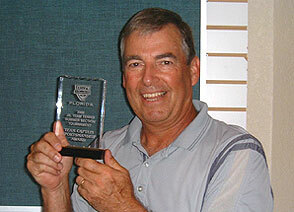 The coach/captain plays a very crucial role at these championships. 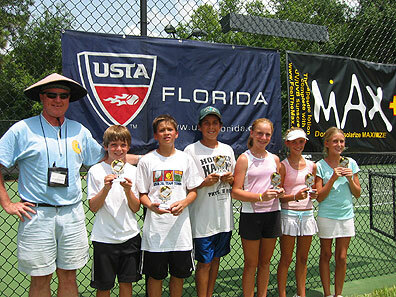 USTA Florida would like to thank the Polk County Tennis Association, (PCTA,) led by Dave Beerman, for all its efforts in making this tournament such a success. 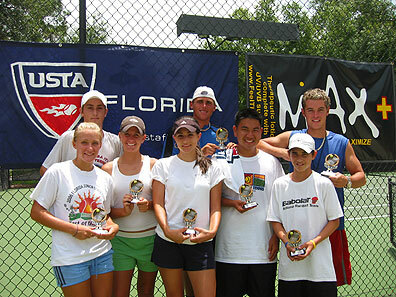 The volunteerism, generosity and services are simply outstanding and USTA Florida greatly appreciates the PCTA's continual support.